Capacity: 1900mAh. Nikon DSLR D800E. Nikon DSLR D7000. Nikon DSLR D800. 1 Battery For NIKON EN-EL15. Nikon DSLR D600. Nikon DSLR V1. Graduated filter. Nikon D7100. - Nikon D7000. - Nikon 1 V1. - Nikon D600. - Nikon D610. - Nikon D750. - Nikon D800. - Nikon D800E. Nikon DSLR D800E. Nikon DSLR D7000. Nikon DSLR D800. 1 Battery For NIKON EN-EL15. Nikon DSLR V1. Color filter. Graduated filter. Square filter. Nikon DSLR D800E. Nikon DSLR D7000. Nikon DSLR D800. Nikon DSLR D600. Nikon DSLR D600E. Nikon DSLR D610. Nikon DSLR V1. Size:(mm): 57 39 20 mm. Original Qumox Rechargeable Li-ion Battery High energy density, high recycle life,long life battery Extra power for your digital video camera / camcorder High capacity / rechargeable Li-ion battery with premium cell 1 year warranty ( does not cover physical damage ) Specifications: Voltage: 7. Nikon DSLR D800E. Capacity: 1900mAh. Nikon DSLR D7000. Nikon DSLR D610. Nikon DSLR D800. Nikon DSLR D600. Nikon DSLR D600E. Nikon DSLR V1. Compatible with Battery EN-EL15 EN-EL15A for Nikon D850 D7000 D7100 D7200 D7500. Original Green Cell® Battery. Green Cell®. The technology of the battery does not differ from the original. Set of protections. Nikon D600 / D800 / D800E / D7000 / V1 And more. 1 x Genuine Nikon EN-EL15 used Li-ion Battery. Note: 100% Original ! Item Used! But Good quality! Product Details. Compatible with the Nikon D700, D7100, D7200 and D7500. Compatible with the Nikon D800, D800E, D810 and D810A. Compatible with the Nikon D600, D610 and D500. 1 USB Cable. 11.5 10 3cm / 4.5 3.9 1.2in. Nikon EN-EL15,ENEL15 battery from Duracell. Fits: Nikon D500, D600, D610, D800, D800E, D810, D810A, D7000, D7100, D7200, 1 V1. Duracell's products are designed to give you maximum power. Whatever your power needs, it will last longer with Duracell. Duracell 7.4 Volt 1400mAh Digital Camcorder Battery. High quality lithium ion battery from Duracell. D810 D800 D800E D750 D610 D600 D7000 D7100 D7200 V1 MB-D11/D12. Overload protection. 1 x Genuine Nikon EN-EL15 Battery. Nikon EN-EL15. Nikon D600 /D610 / D800 / D800E / D7000 / V1 / MB-D11 / MB-D12 / MB-D14 / MB-D15. Battery Type:Li-ion. Battery Volt: 7.0V. Battery Capacity: 1900mAh, 14Wh. Duracell's products are designed to give you maximum power. Whatever your power needs, it will last longer with Duracell. Duracell 7.4 Volt 1400mAh Digital Camcorder Battery. Compatible with Nikon ENEL15 EN-EL15 ENEL15A EN-EL15A VFB10702. Original Green Cell® Battery. Green Cell®. The technology of the battery does not differ from the original. Set of protections. Performance, durability and safety. Save £10 when bought with the ProCube Wireless Charging Station. Nikon DSLR D800. Nikon DSLR D600. Nikon DSLR D600E. Nikon DSLR D800E. Nikon DSLR D7000. Nikon DSLR D610. Nikon DSLR V1. Input: 5V 2A 10W, and Output: 8.4V 0.6A 5W. Output: 8.4V 0.6A 5W. Input: 5V 2A 10W. 11.5 10 3cm / 4.5 3.9 1.2in. Nikon DSLR D800E. Nikon DSLR D7000. Nikon DSLR D800. Nikon DSLR D600. Nikon DSLR D600E. Nikon DSLR D610. Nikon DSLR V1. For Nikon D7200 D7100 D7000 D600 D610 D800 D810 D750 Nikon 1 V1. With this lithium-ion battery, you are purchasing a high-quality battery, which is a high-performance battery. the Replica-compatible batteries have all the electronic precautions of the original batteries. D7100/ D7000/ D800/. Nikon 1 V1, Nikon D600/. Fit : Nikon SLR. ,Price is for 1 battery. This genuine Nikon high capacity. We will always help you to have a 100% positive happy buying experience. Fit to the device models:NIKON 1 V1, Coolpix D7000, D600, D610, D7000, D7100, D7200, D750, D800, D800E, D810, D810A, Digital SLR D800, MB-D12. Compatible with the battery part numbers:EN-EL15. High capacity - 1600mAh. -up to 1000 cycles. All Hahnel batteries are fully tested and built with lithium-Ion technology to ensure maximum power and battery life. Hahnel batteries let you work seamlessly when you are on the move. 2000mAh, 7.0V. Nikon D750. - Nikon D610. - Nikon D800. - Nikon D600. - Nikon 1 V1. - Nikon D800E. - Nikon D810. - Nikon D810A. Integrated microchip prevents overcharging, overheat & provide short circuit protection. Features a capacity of 1400mAh and 7V. Battery: Model: EN-EL15 Type: Li-ion Battery Voltage: 7 V Capacity: 2550 mAh Dimensions: 5.5*4*2cm Package included: 1 x Battery Brand Unbranded Type Battery EAN Does not apply To Fit Camera Compatible Brand For Nikon MPN Does not apply Chemical Composition Li-Ion Capacity 2550 mAh. This sale is for a new Top-Max 1950 mAh EN-EL15 Battery for D7000 D7100 D7200 D750 D600 D610 D800 D810 V1 as seen in the pictures. make Supersized seem small. Fit to the device models:NIKON 1 V1, Coolpix D7000, D800. RoHS Approved for toxic free. Compatible with the battery part numbers:EN-EL15. Nikon D500/ D600 /D610 / D750/ D800 / D810 / D800E/ D850 / D7000 /D7100 / D7200 / V1 /. Genuine Original Nikon EN-EL15 Li-ion Battery. 1 x Genuine Nikon EN-EL15 Li-ion Battery. Nikon Vertical Battery Grip MB-D11 / MB-D12 / MB-D14 / MB-D15. 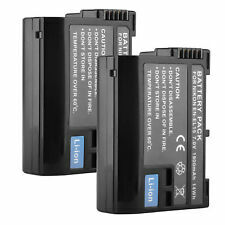 The battery is compatible with the Nikon D800 D800e D7000 D7100 D600 D610 and Micro-V1 and has a capacity of 1620 mAh. Wicklow - Pixel Battery EN-EL15 for Nikon. 1 x Li-ion battery. Warranty Included. Item model number: ENEL15a. Compatible with the Nikon D700, D7100, D7200 and D7500. Compatible with the Nikon D800, D800E, D810 and D810A. Compatible with the Nikon D600, D610 and D500. Compatible with the Nikon 1 model V1, V2 and V3. Genuine Ansmann Battery For NIKON. D610/ D7100/ D7000/ D800/. D810/ D800E. Nikon 1 V1, Nikon D600/. Fit : Nikon SLR. D850 D810A D810 D800 D750 D610 D600 D7000 D7100 D7200 V1 MB-D16 MB-D15 MB-D12 MB-D11. Battery for Nikon EN-EL15 compatible Li-Ion Battery.